The bookends of my life are my 1951 birth as a Scandinavian-American, baby-boomer twin in Edgerton, Wisconsin and my most recent breath in the present moment wherever I am. Within this Life in Full is a professional career bookended by employment as an Alaskan geologist in 1975 and as a New England professor in the present moment. My…. Biographic Sketch explains my origins and career twists and turns, and is useful for media announcements and introductions. Curriculum Vitae is my long list, used mainly for external judgment of my professional career. Condensed Vitae is my short-list of the main points of my professional career. 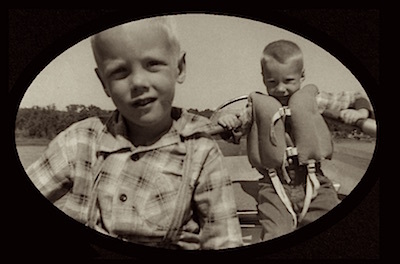 Photos: Author (left) and his now-deceased twin brother James in 1956 “messing about in boats” on a kettle lake in northern Minnesota.